(Mayfield won 3-0 on penalties). Mayfield United, last season’s beaten finalists, qualified for the last eight of the Murphy’s Stout AOH Cup with a shootout win over league rivals and neighbours Ballyvolane after the sides had played a 1-1 draw in Saturday's wind spoiled game at Mayfield United Park. It was a deserved win, even if the hosts took the long way home. 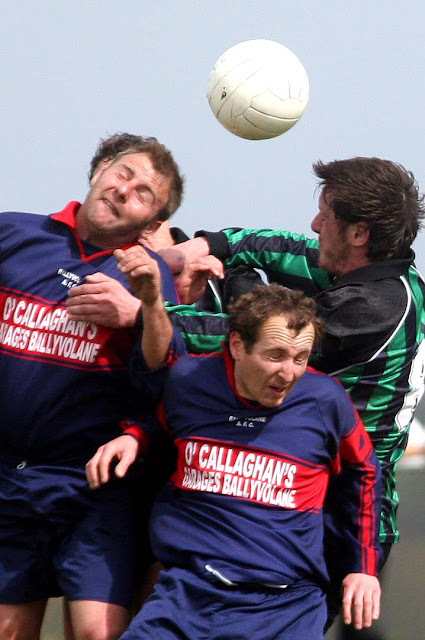 They played against the gale force wind in the first half and Ballyvolane managed to go ahead but Mayfield had quite a few attacks. Mayfield dominated the second half from start to finish, equalised and hit the bar. They also had the edge in extra time before going on to clinch a comfortable 3-0 decision in the shootout. 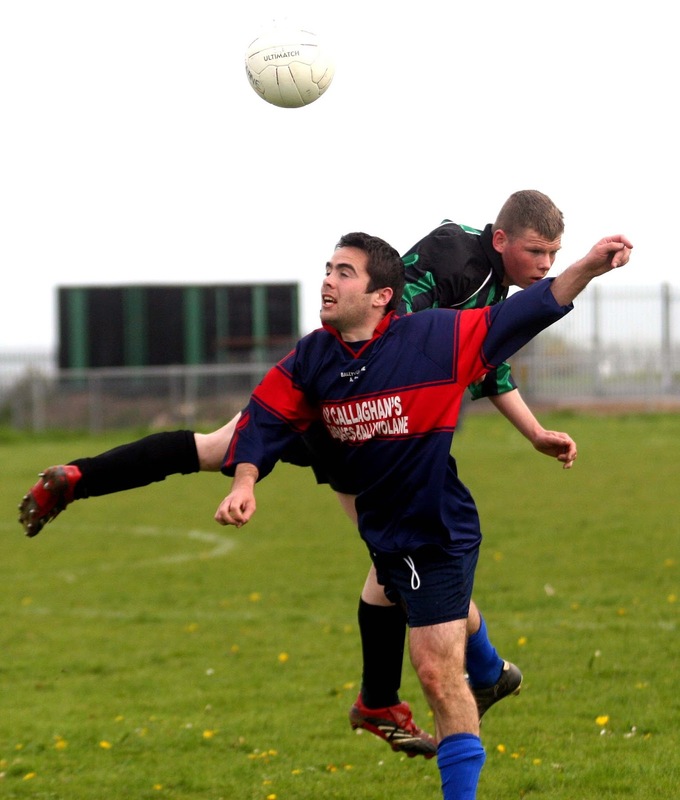 Ballyvolane were generally unable to harness the wind in the opening half but there were some notable exceptions. In the 9th minute, midfield ace Liam O’Riordan tried a well placed low free and the ball broke to skipper Adrian McDonald but his crisp shot from the edge of the box was wide. In the 16th minute, Kevin O’Shea neatly lifted the ball over the advancing Mayfield defence and found Steven O’Keeffe on the right. But keeper Brian Ramsell advanced smartly and made an excellent save. The goal came in the 23rd minute, from a well-hit corner by Liam O’Riordan. It evaded the jump of Ramsell, perhaps the nearby presence of Ger O’Riordan had something to do with that, and Keith Keane headed in at the far post. Mayfield, with young Ian Murphy working hard up the left, regularly beat the wind to get into dangerous positions and they came very close to scoring from Murphy’s 32nd minute right wing corner. There were a series of efforts on goal, including a shot by Ian Saville and a header by David O’Donoghue, but they all came to nothing. Just before the break, Liam O’Riordan broke up a Mayfield attack and raced into the opposition half, his enterprising move leading to a corner, which was headed narrowly wide by scorer Keane. Mayfield piled on the pressure at the start of the second half but, over-eager, they too made poor use of the contrary wind and the big talking point of the third quarter was a double sending off by referee Tom Tully. The Mayfield equaliser came three minutes later, in the 67th minute. Ian Murphy, who hadn’t made the best use of earlier crosses, finally got the wind right and Conor Lehane beat the keeper to head in. Mayfield had two late chances to seal it in normal time. But keeper Hurley made a fine save from O’Donoghue after a shot by Lehane rebounded. Hurley though was beaten with three minutes to go when a shot from the wing by Saville sailed past him and crashed down off the bar. 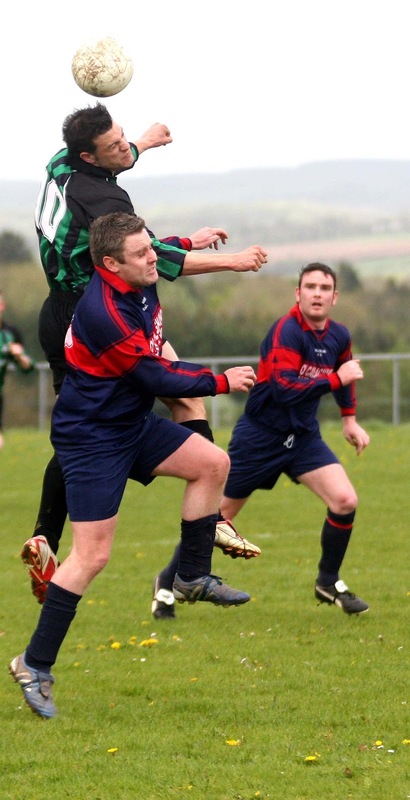 Trevor Aherne tried to force the rebound home but was quickly crowded out. 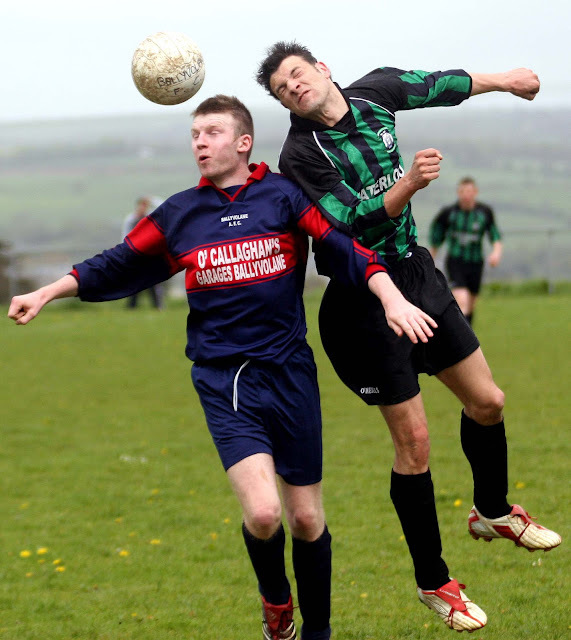 Ballyvolane had the wind in the first period of extra time but didn't threaten until the final minute when a run by the tricky John Magnier led to a corner which was well palmed away by Ramsell. Mayfield forced three corners in the second period but couldn't get past Hurley. 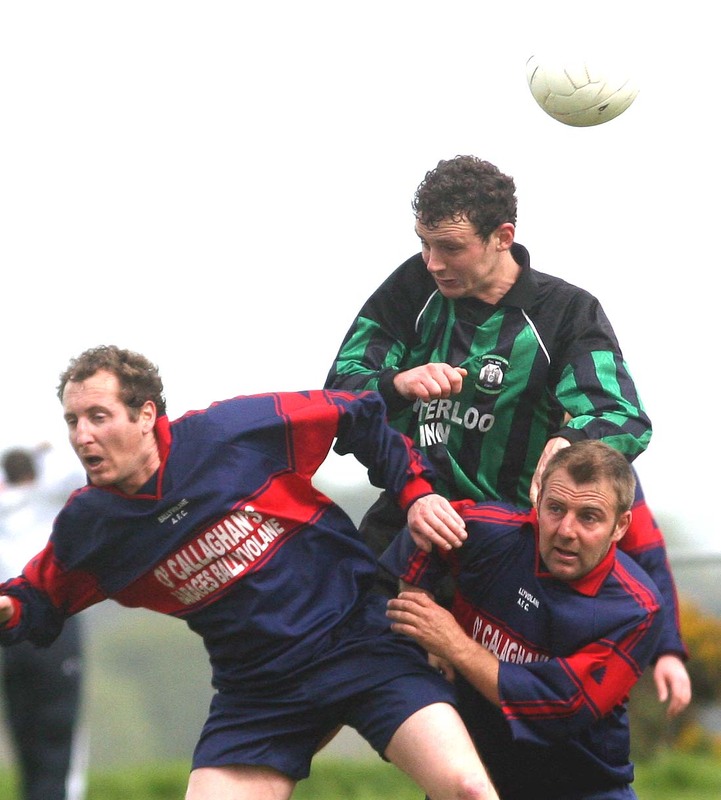 The shootout went well for Mayfield with David O’Donoghue, Fergus O’Donoghue and Ramsell himself all scoring. It was a tale of woe though for their visitors. Colm Forde drove well over, Paul O’Keeffe saw his effort well stopped by Ramsell and then Liam O’Riordan sent his shot wide to hand Mayfield a 3-0 decision. Mayfield United: Brian Ramsell, Ger O’Mahony, Johnny Buckley, Paul Keegan, Ray O’Mahony, Niall O’Sullivan (captain), David O’Donoghue, Conor Lehane, Trevor Aherne, Ian Saville and Ian Murphy. Sub used: Fergus O’Donoghue for R. O’Mahony (103rd minute). Ballyvolane: Shane Hurley, Paul O’Keeffe, James Burke, Liam O’Riordan, Ger O’Riordan, Keith Keane, Kevin O’Shea, Adrian McDonald (captain), Steven O’Keeffe, Colm Forde and John Magnier. Sub used: Rob McNeill for McDonald (62nd minute).